The finalists exhibition of the 10th International Arte Laguna Prize will open on Saturday, March 19, 2016 at Nappe Arsenale Nord, one of the most popular places in the world for contemporary art. Now in its tenth year, the Prize stands as one of the most enduring and prestigious art awards. It enjoys high interest in the art world, offering recognition to emerging and established artists alike, as well as exposure to international critics. 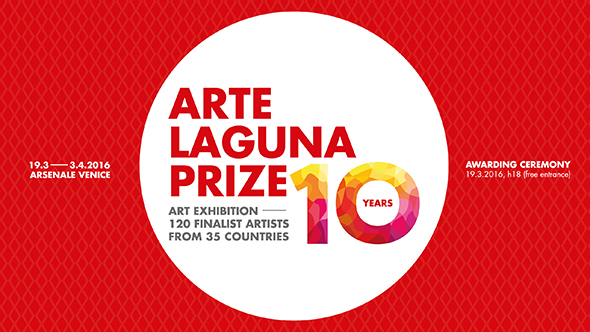 This year the Arte Laguna Prize features content of even higher quality in terms of artistic and cultural value and high-level international collaborations: 18 international partners have embraced the Arte Laguna project, among them Swatch, Thetis SpA, Telecom Italia Future Centre, Riva 1920 and the noted art foundations Berengo and Foundry Battaglia. The main exhibition will feature 30 paintings, 30 sculptures and installations, 30 works of photographic art, 10 videos, 10 land art projects, and 5 performances that will be staged live during the exhibition’s opening ceremony. In addition, the historic areas of Telecom Italia Future Centre will host five works of virtual and digital art, created entirely with the use of new technologies and the web or involving the vast world of the digital. A selection of 120 artists, whose work will be on view until April 3, will be made by directors of foundations and museums, independent curators, and art critics led by Igor Zanti, the curator from Milan and director of IED Venice, who has overseen the prize since its inception: Miguel Amado, Anna Bernardini, Barbara Boninsegna, Denis Curti, Enrico Fontanari, Suad Garayeva, Vasili Tsereteli, Sabrina Van der Ley, Simone Verde, and Bettina von Dziembowski. The opening night will also host the awards ceremony for the six overall winners, who will be awarded a cash prize of 7,000 euros each. The winners will be chosen by a jury comprised of 11 international jurors; their choice of winners will be complemented by a selection made by the Prize’s International Partners, who will choose the artist or artists with whom they wish to collaborate in 2016. Collaborative possibilities range from exhibitions to festival participation, involvement in production, and the creation of new works during a residency in a multicultural environment with other artists. Among these interesting partnerships is the one with Swatch. The Swiss watchmaker will welcome one of the participating artists to its residency program at The Swatch Art Peace Hotel in Shanghai, a unique community in which artists from around the world work in complete freedom in the hotel’s 18 studios and apartments. With regard to the brand’s artist-in-residence program in Shanghai, Carlo Giordanetti continued: “We give artists what they need most: the time and freedom to create their work—to explore ideas, materials, new modes of expression, and to engage with other artists in a vibrant, exciting creative community. We believe in artists and their magical ability to create new ways of seeing and thinking. By making art, artists make space for new ideas that can have a surprising and amazingly positive impact on the world”.